At a distance of 58 km from Karwar, 75 km from Murudeshwar, 21 km from Ankola, 165 km from Hubli, 163 km from Panjim and 514 km from Bangalore, Gokarna is a small town in the Uttara Kannada District of Karnataka. It is a famous pilgrimage center and also one of the top destinations of Karnataka Tourism because of its beautiful beaches. 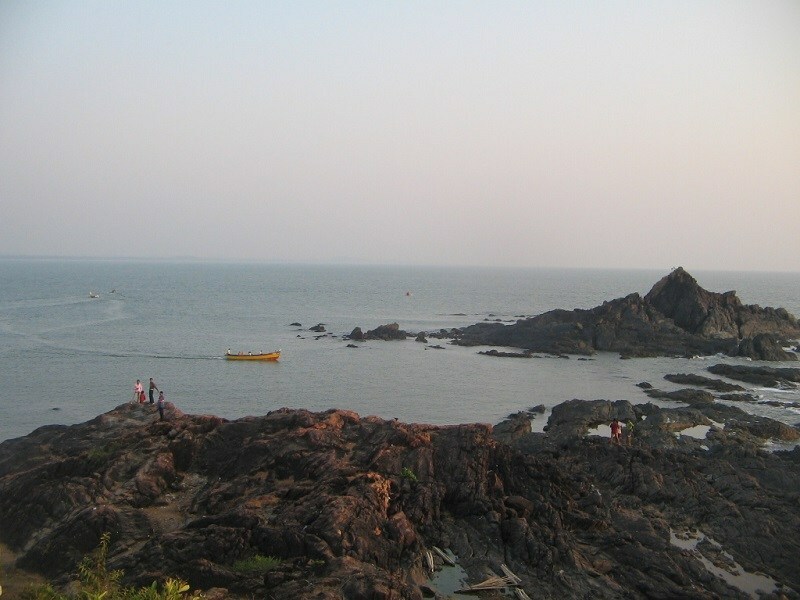 Gokarna is one of the must visit places in Karnataka as part of Goa packages. At a distance of 345 km from Bangalore, 275 km from Karwar, 251 km from Mysore, 132 km from Coorg, 372 km from Goa, 413 km from Coimbatore, 420 km from Kochi and 682 km from Chennai, Mangalore (or Mangaluru) is an important port city on the west coast and the headquarters of Dakshina Kannada district in Karnataka State. Located at the confluence of Nethravathi and Gurupura Rivers, it is among the popular Tourist places in Karnataka and one of the popular 2 day trip from Bangalore. Lying between the Arabian Sea and the Western Ghats, Mangalore is one of the major ports of India. The city derives its name from the local Hindu goddess Mangaladevi. The sultans of Mangalore built the city as a strategic ship building base. Today, the city is one of the major ports involved in coffee and cashew export. At a distance of 65 km from Mangalore, 102 km from Murudeshwar, 147 km from Shimoga, 309 km from Mysore and 403 km from Bangalore, Udupi is a famous temple town and headquarters of the Udupi District. It is also the source of Udupi cuisine which is famous across the world. It is also one of the most famous tourist places to visit in Karnataka, mainly for it's pilgrimage importance and beautiful beaches. The name of this city was originated from Odipu. According to local legend, the 27 stars of the Hindu astrology were married to the Moon and soon after, the Moon lost its luster. As Lord Shiva is the last resort for everyone, the Moon and the stars created a Lingam and offered puja. Udu means Lord and Pa means Stars in Sanskrit. At a distance of 179 km from Kochi, 124 km from Palakkad, 176 km from Coimbatore, 113 km from Thrissur, 158 km from Ooty, 241 km from Mangalore, 352 from Bangalore, 376 km from Trivandrum and 213 km from Mysore, Kozhikode (also known as Calicut) is a city in the state of Kerala. It is the 3rd largest city in Kerala and the headquarters of Kozhikode District. 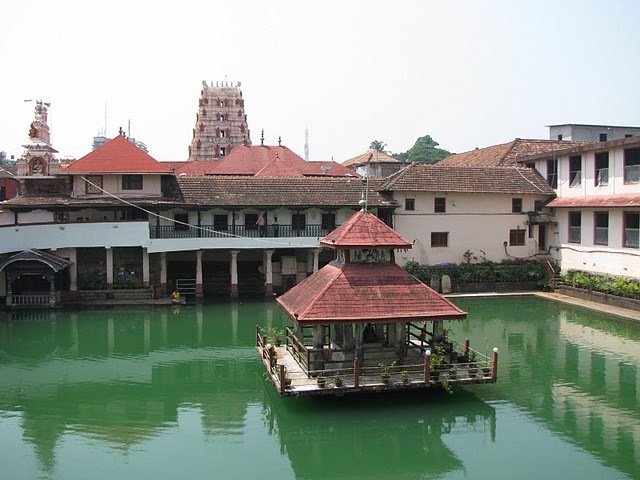 The name Kozhikode is said to be derived from Koyil (palace) Kotta (fort). 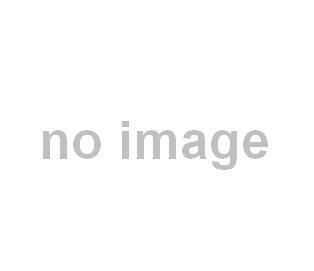 This is known by various names, for the Arabs it was Kalikat, for the Chinese it was Kalifo. Tipu Sultan, during the conquest of Malabar, unsuccessfully attempted to change the name of the city to Firozabad. Malayalis have always preferred to call it Kozhikode. With the Arabian Sea on the west and Wayanad Hills on the east, Kozhikode is a popular places to visit in Kerala. At a distance of 12 Kms from Mangalore Railway Station, Tannirbavi Beach is located towards the southern end of Mangalore Port. 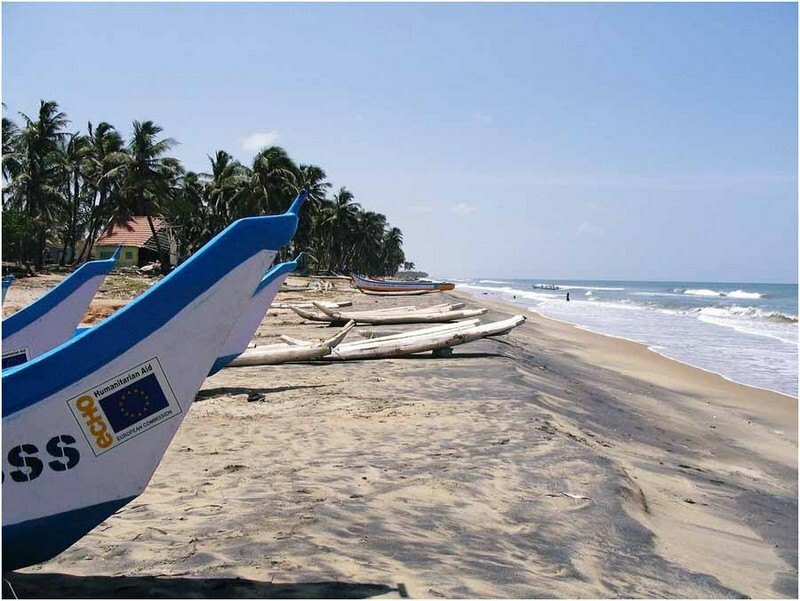 The beach is the property of Mangalore port trust. 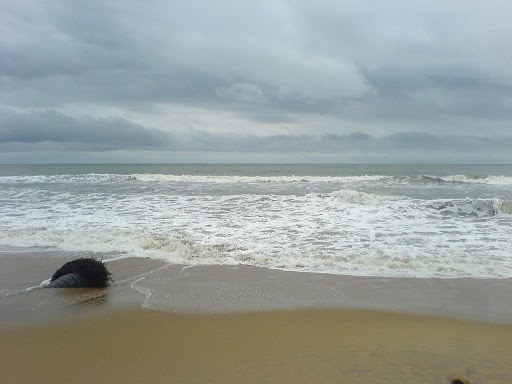 This is one of the best beaches of Mangalore and among the top Mangalore tourist places. The soft sands of the beach and breezy winds of Arabian Sea offer memorable experience. It is also a favorite spot to watch the sunset. You can see the remains of a ship which sank 15 years ago near the beach. This beach is comparatively deserted and is a great spot for safe swimming. Due to the poor connectivity, it's important to have your own vehicle to visit this beach in Mangaluru. 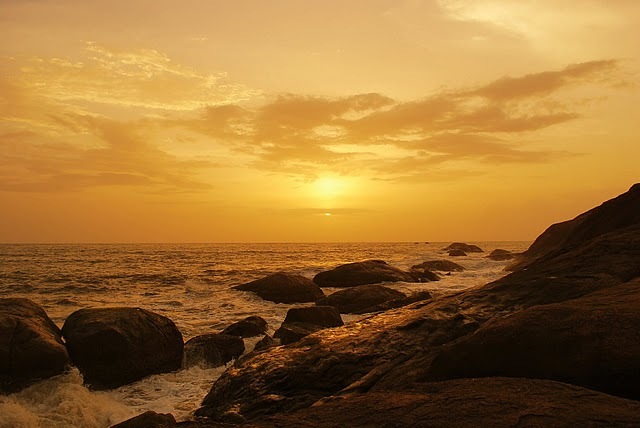 At a distance of 15 Kms from Udupi Railway Station, 65 Kms from Mangalore & 100 Kms from Murudeshwar, St. Mary's Island is a group of small beautiful islands to the north of Malpe Beach near Udupi. It is said that Vasco da Gama first reached this Island before reaching the Kappad Beach (near Calicut) while finding sea route to India. The island has two beautiful beaches and crystallized basalt rock formations. The unique rock formations scattered through out the island giving a special landscape to the place. The rock formations are one of rarely found in the world. Eastern beach boasts of virgin sands, western beach is entirely made of sea shells. This unspoiled island is a very beautiful place with white sands, coconut trees, blue waters & pleasant atmosphere. 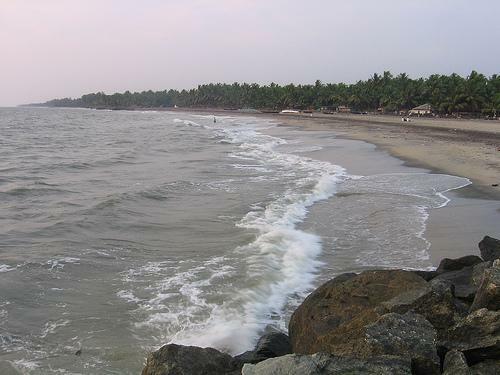 At a distance of 10 Kms from Kozhikode Railway Station, Beypore Beach is located at the mouth of the Chaliyar River. Now an important port and fishing harbor, this place was also an important trade and maritime centre during the days of the early Arab and Chinese travelers and the Europeans. The Beypore Beach is a commercial center for ship building and has existed here for more than 1000 years. This boatyard is famous for making a distinctive ship vessel known as 'Uru'. One of the major attractions at Beypore is its magnificent 2 km long stone bridge called as Pulimoodu, built entirely of stones, making a pathway into the sea. Nearby attractions in Beypore are fishing harbor and Kadalundi Bird Sanctuary (7 kms). Baypore is little close Madras Trunk Road. At a distance of 10 Kms from Udupi Railway Station, Malpe Beach spread between Swarna Nandi River and Malpe Port is one of the finest beaches in Karnataka. Malpe is one of the most important ports of Karnataka. The endless stretch of golden sand, graciously swaying palm trees, the clear blue sky and the clean waters of Arabian Sea all set a perfect mood for an unforgettable holiday. 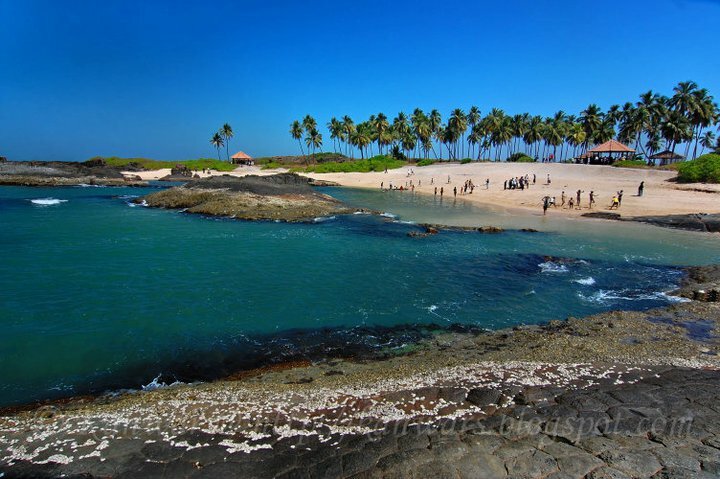 Malpe Beach is characterized by silver white sand beach and rocky islands, which is still quite secluded and not visited by a lot of tourists. It is a great place for boating and swimming. October to January is the best time to visit Malpe. St. Mary's Island can be reached from here. At a distance of 20 Kms from Kozhikode Railway Station, Kappad beach is one of the most charming Kerala beaches and also one of the best Kerala tourist places. Vasco da Gama landed on Indian soil on 27th May 1498 at Kappad beach along with 170 men. There is a monument on the beach that commemorates the landmark event of Vasco da Gama's arrival. This marked the beginning of a new era in the relationship between the Indians and the Portuguese which lasted for 4 to 5 centuries. The beach is ideal for relaxing and playing around with sand. 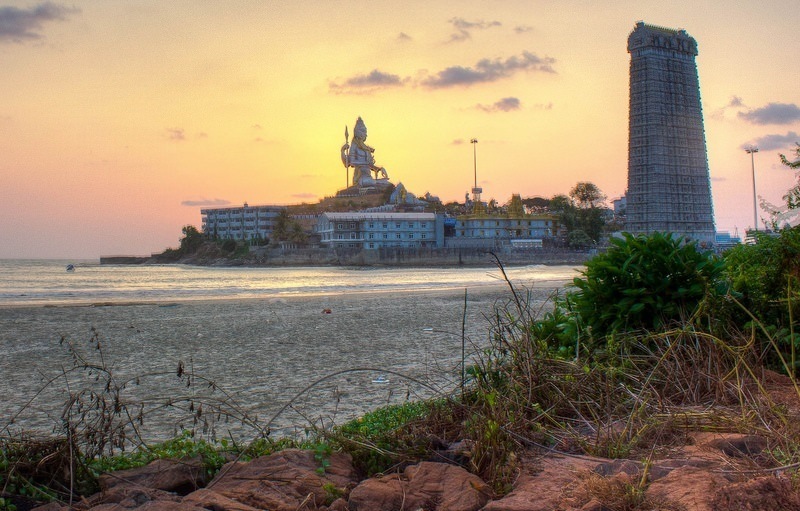 Devi Temple, which is believed to be 800 years old, is situated on top of a rock near the beach. 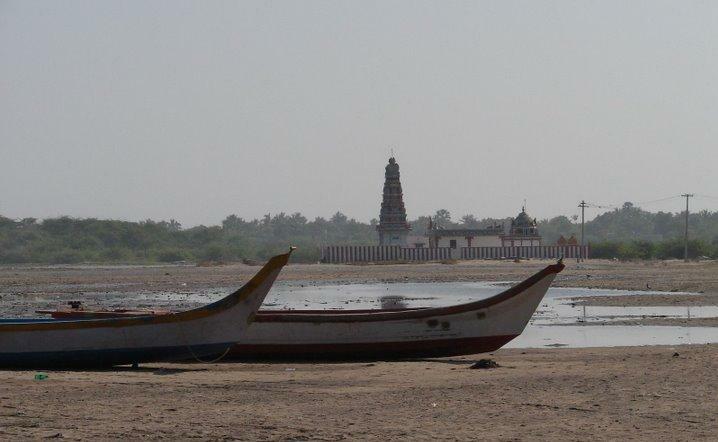 Karappula River at Elathur close to the beach is a good place for boating. Sunset is a great site to watch here, in the combination of Sea and River. This place is very close to NH17 towards Mangalore. It is connected by frequent buses from Kozhikode. At a distance of 16 Kms from Udupi Railway Station, Kaup Beach is a beautiful beach situated close to NH17 between Udupi & Mangalore. 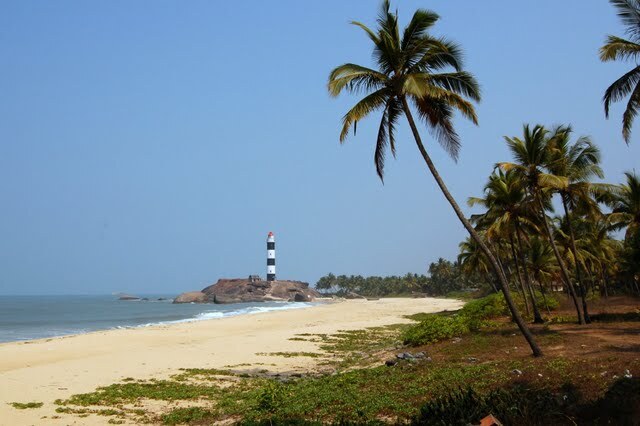 The light house situated on a hillock at the northern end of the beach is a beautiful sight to watch. The beach is a serene place with nature's beauty in abundance. The 100 feet high light house was built by the British and it's a photographer's paradise. Kaup beach is covered by palm groves all the sides. 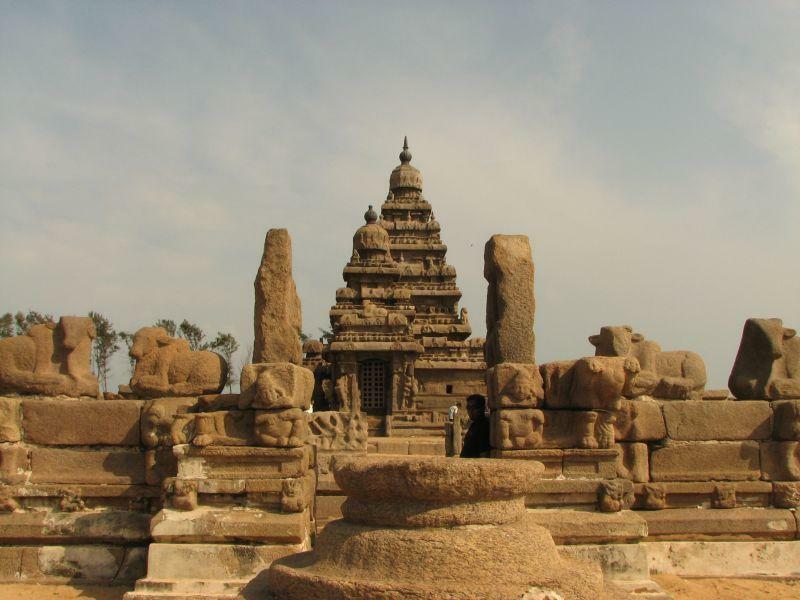 Kaup is also known for the temple of Goddess Mariamma. There is also an ancient fort located in Kaup which is seen in ruins now. Kaup was once a famous Jain Kshetra and home for several Jain temples. At a distance of 167 Kms from Kozhikode, 73 Kms from Mangalore & 28 Kms from Kasaragod, Bekal Fort Beach is situated near Bekal Fort (about 1 Km). 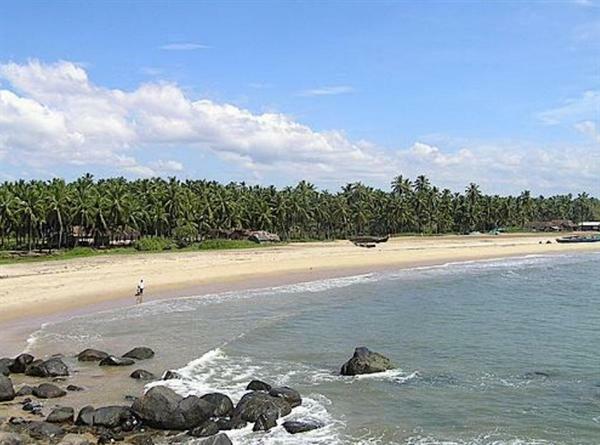 It is one of the best Kerala Beaches situated in Kasaragod district. It is one of the best maintained beaches in this region. The beach is a vast expanse of white sands dotted with palm trees. Two huge sculptures with beautiful murals have been set up in the beach. The beach is illuminated with electric bulbs during night so that people can enjoy the beach even after dusk. There is a water park for children on the premises which is an added attraction. 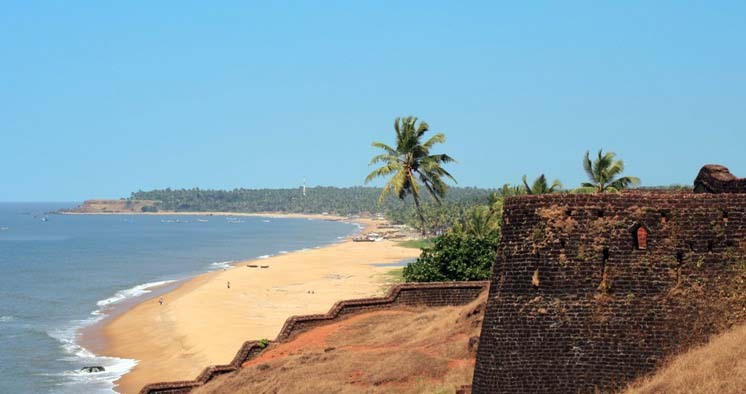 The beautiful walkway allows the visiting tourists to explore the beauty of the Arabian Sea and panoramic view of the surroundings including Bekal Fort. At a distance of 38 Kms from Kozhikode, Payyoli Beach is a beautiful stretch of golden sands located in Payyoli village close to NH17 towards Mangalore (before Vadakara). Payyoli is one of the most outstanding tourist spots in this region with several thousands of tourists visiting the beach every week. The beach is ideal for water sports and sun-bath. The beach has a stretch of coconut palm trees which enhances the beauty of this lovely beach. This is a good place for swimming. Trikkottur Perumalpuram Temple is nearby attraction. This is the home town of India's sprint queen P.T Usha. Payyoli is connected with frequent buses from Kozhikode. 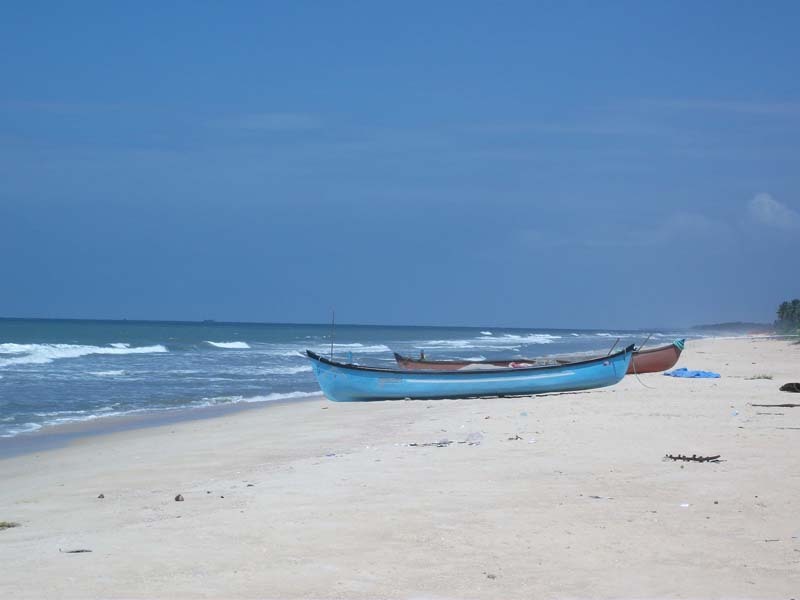 At a distance of 31 km from Ernakulam Junction (South) Railway Station, Cherai Beach is a beautiful beach located in Cherai village. 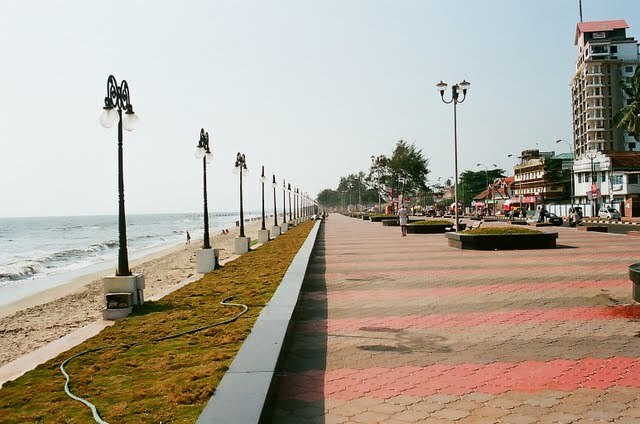 This is one of the popular tourist places to visit near Kochi and also one of the top beaches in Kerala. The 15 km of long golden beach is very clean, shallow, and famous attraction for swimming and sunbathing. This is one of the few places where we can see the lagoon and ocean separated only by a few hundreds of metres. 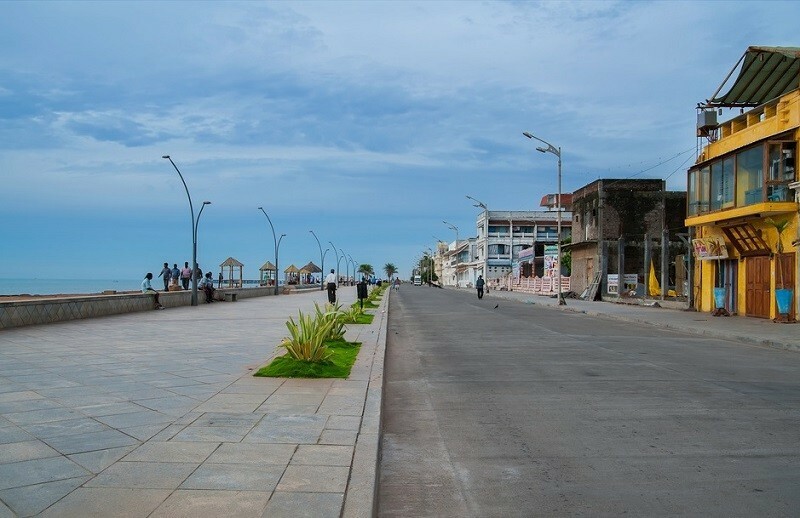 The newly beautified 400 meters of the main beach has a walkway and high mask lamps which make the beach enjoyable even at night. The Beach is very safe and tourists of all age groups can enjoy the Beach alike. The beautiful beach is studded with seashells of various hues and shapes. There is a park for children on the beach. Water Scooter and Speed Boats are also available. Dolphins are also spotted at this beach. The far end of the beach lined with Chinese fishing nets is a beautiful sight. 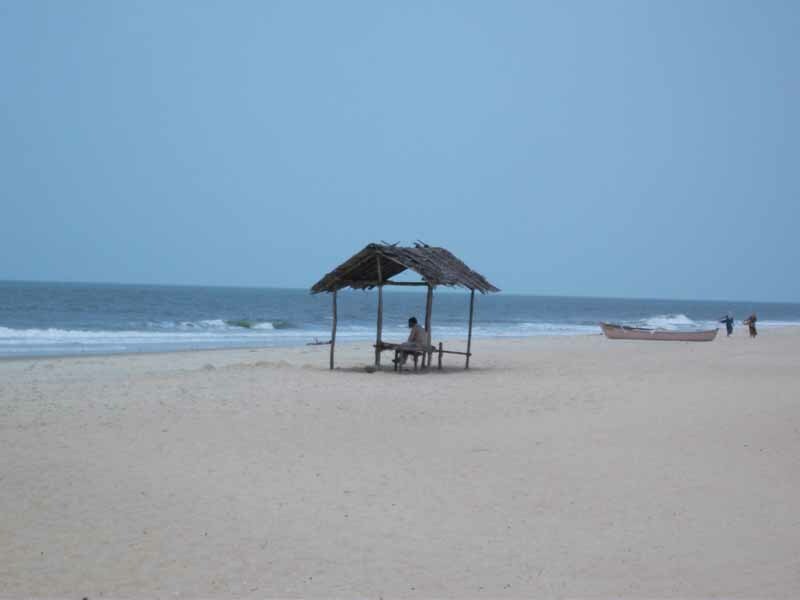 At a distance of 11 Kms from Mangalore Railway Station, Panambur Beach located near the Mangalore Port is one of the most frequently visited Mangalore beach and also one of the famous Mangalore tourist places. The beach offers very good views of the sunset. The beach attracts good number of visitors due to its close proximity to the city. The ships anchored out in the sea waiting for berth in the harbor can be seen from the Beach which presents an attractive picture. Camel ride is an added attraction at this beach. This beach is a safe place for swimming. The beach offers boating and water sports facilities to the visitors. Panambur beach is famous for International Kite Festival conducted during the last week of April. At a distance of 10 Kms from Mangalore Railway Station, Someshwar Beach located near Ullal Railway Station is a well known beach near Mangalore. This beach is famous for clean & white sands. 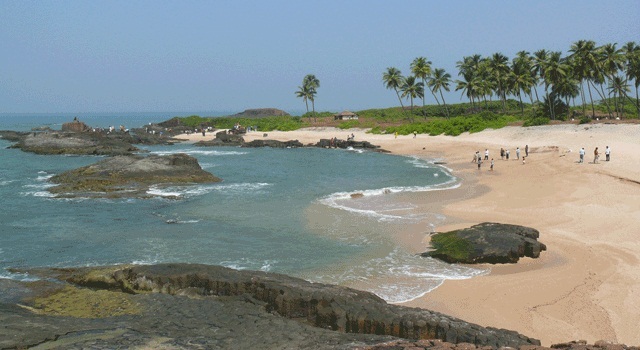 It is one of the popular Mangalore places to visit. It is also known for the large rocks called 'Rudra Shile' situated near the beach. Someshwara Beach is a natural, safe and clean beach. 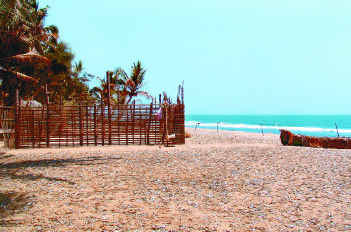 The beach offers breathtaking views of the Arabian Sea and is an ideal spot for nature lovers and swimmers. The other attraction of Someshwar beach is the historical Somanath Temple constructed during the rule of the famous Queen Abbakka Devi (16th century) is situated towards north. Presiding deity here is Lord Shiva and the temple is adorned with beautiful sculptures. In the temple premises there is the statue of great sage Parusharama. As per mythology, the coastal region of Karnataka (along with Kerala) was the creation of Parusharama. At a distance of 23 Kms from Mangalore Railway Station, Sasihitlu Beach situated towards Udupi is a clean beach & stretches about 2 km in length. This place is also famous for a beautiful island called Munda surrounded by Shambhave and Nandini Rivers on one side and Arabian Sea on the other side. At a distance of 10 Kms from Mangalore Railway Station, Ullal Beach is a beautiful beach located to the south of the Nethravati River on the shores of Arabian Sea. 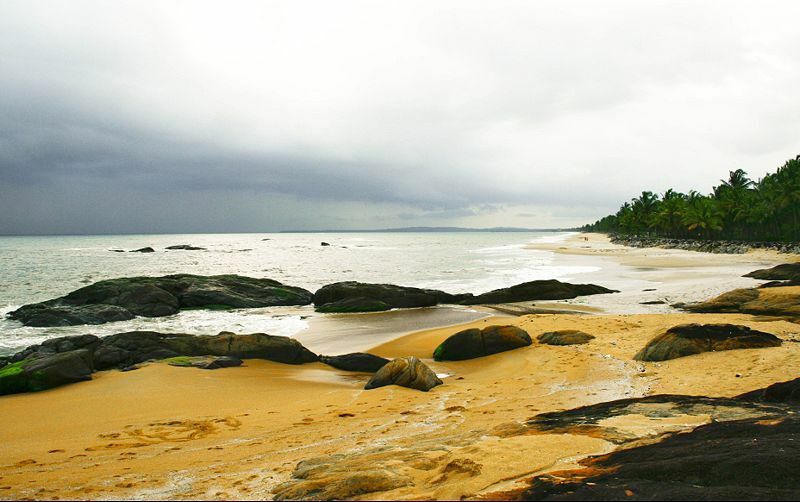 This is one of the best & developed beaches of Karnataka and among the top tourist places in Mangalore. Ullal Beach is also the most serene and calm beach in Karnataka. This silver sands beach also offers breathtaking views of the sunset, especially when viewed through the casuarina groves. Sunbathing and swimming are the two common activities on the beach. There are several water sports available at the Ullal Beach. 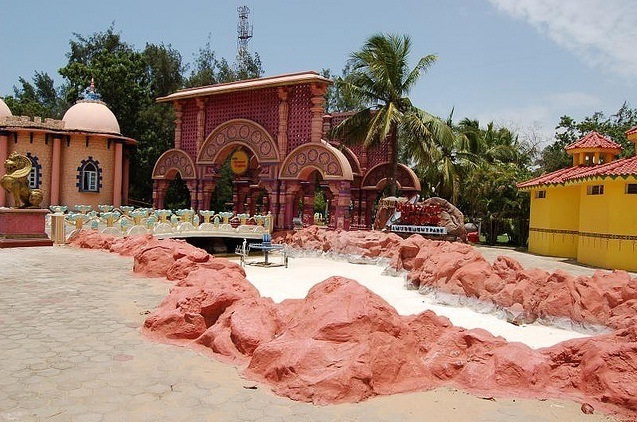 The Summer Sands Beach Resort near Ullal is also a popular picnic spot. The beach is very close to Ullal Bus Station, which can be reached from Thokkottu on Kerala Road. 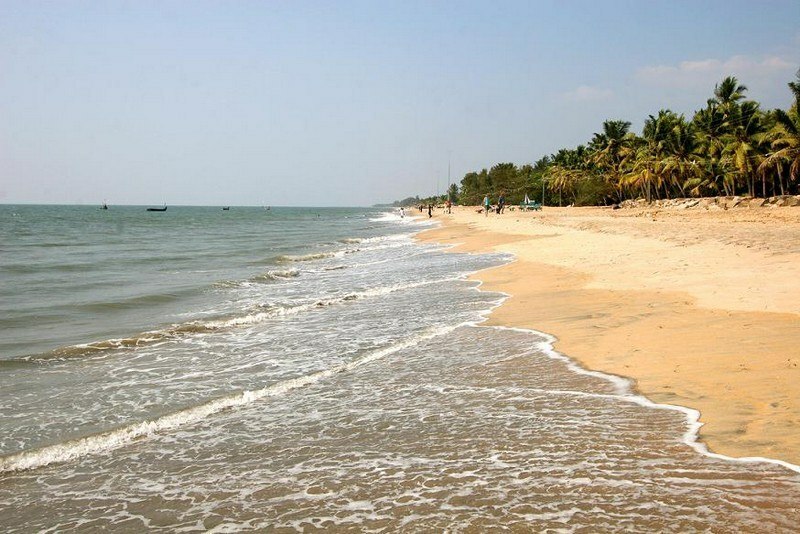 At a distance of 32 Kms from Thrissur Railway Station & 4 Kms from Guruvayoor, Chavakkad Beach is a beautiful beach lying on the coast of Arabian Sea. The beach is full of natural beauty. This beach does not have much commercial activity and less crowded. One can have complete privacy and enjoy the beauty of the beach. Boating is available on country fishing boats. 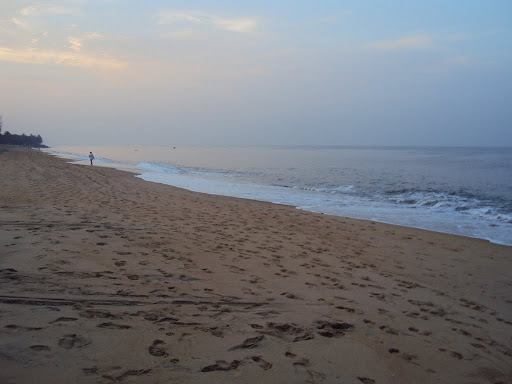 Chavakkad Beach can be reached by private vehicles from Guruvayoor. Tips: Can be reached along with Guruvayoor. At a distance of 24 Kms from Thrissur Railway Station, Nattika Beach is the place to experience the exotic beauty of the nature. Nattika is a wide and virgin beach blessed with an endless stretch of golden sand. This picturesque place offers beach holidays and package tours. The resorts in the beaches provide all modern facilities. 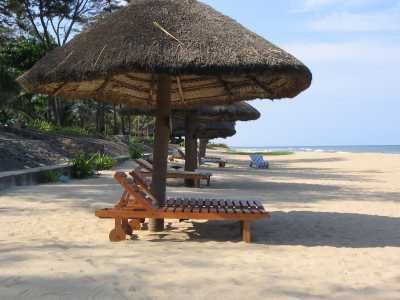 Prime attractions include ride on country boats, elephant rides, deep-sea fishing & beach games. 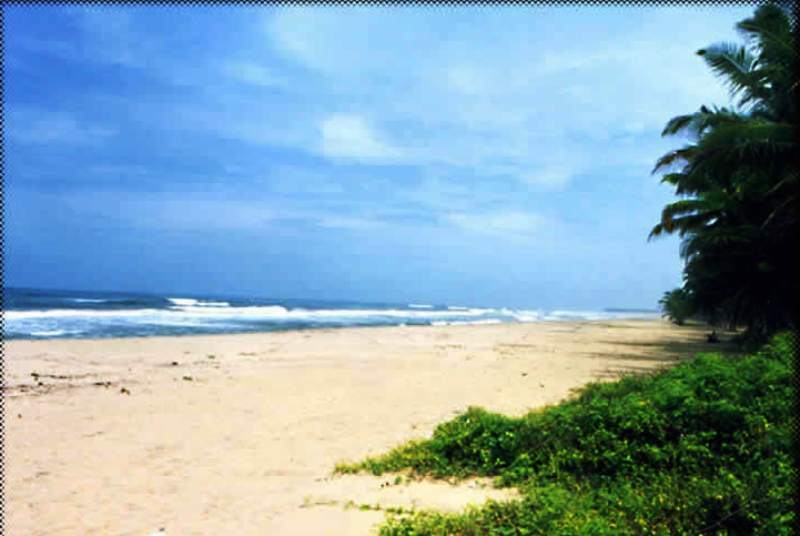 At a distance of 17 Kms from Thrissur Railway Station, Vatanappally Beach is among the beautiful Kerala beaches. It is situated on the coastal belt of Thrissur District. It is an enchanting strip of golden sand laced with the rich greenery of coconut palms. Today, this calm and pleasant beach is a dreamy destination for many tourists. 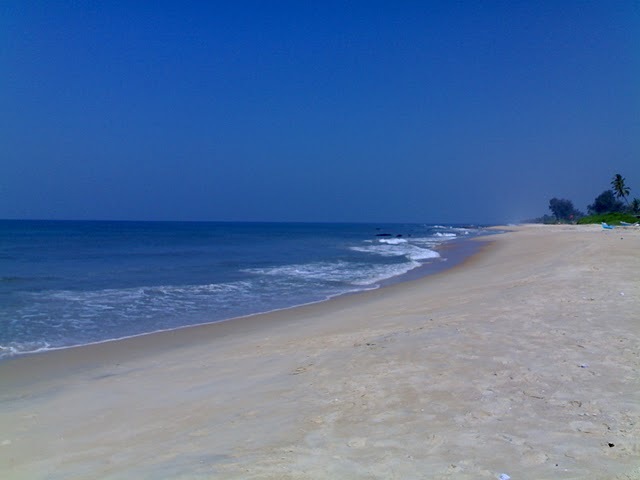 This beach is close to NH17 between kochi and Kozhikode and connected by many bus services from Thrissur. 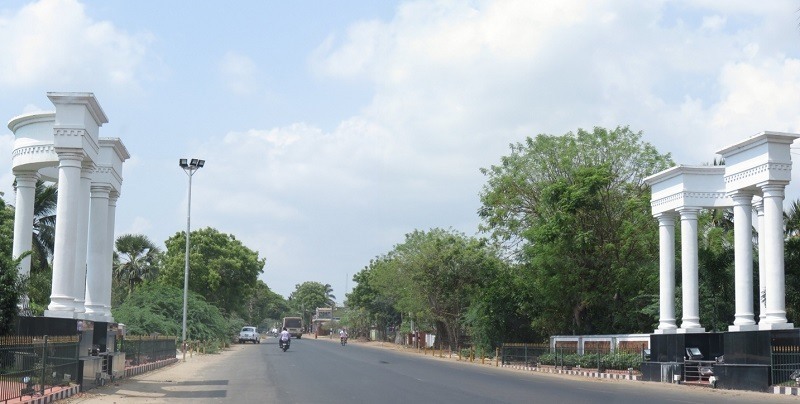 At a distance of 48 Kms from Murudeshwar & 52 Kms from Udupi, Maravanthe is the place separated by Arabian Sea on one side and Souparnika River on the other. 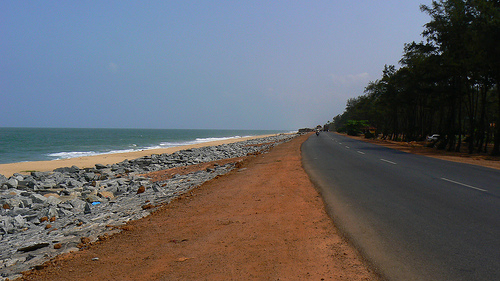 The Maravanthe Beach is a beautiful sight on the NH17 towards Udupi. With a mountainous backdrop of Kodachadri Hills this is a picturesque virgin beach not unspoiled by tourists. The beach is also well lit up at night and the street lights reflect in the waters, making an attractive display. The water at Maravanthe beach is safe for swimming. 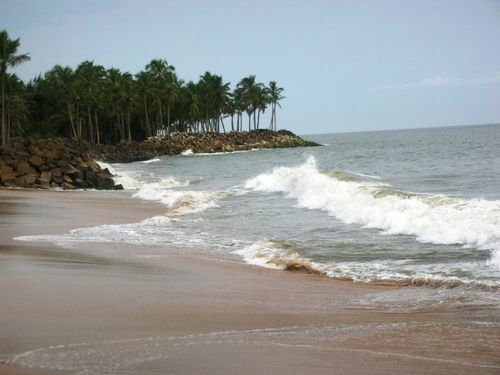 At a distance of 42 Kms from Kozhikode, Kolavipalam Beach is situated at Kolavipalam between Vatakara & Payyoli. Located to the south of Murad River, this beach is known as Turtle Beach. 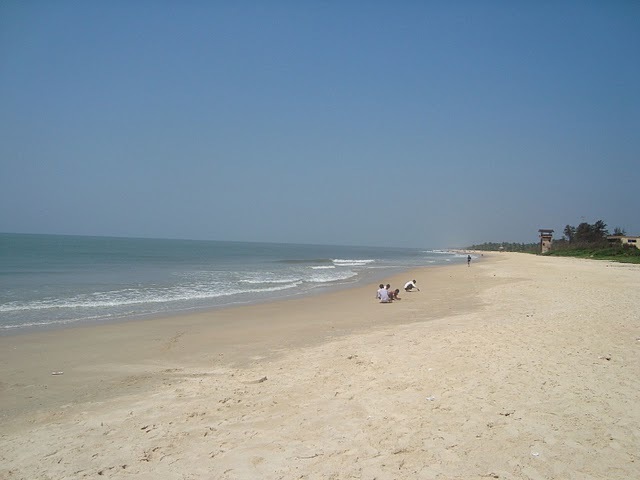 It is the closest beach to Bangalore City at a distance of 312 km. The turtles found in the beach are the famous Olive Ridley turtles. The best season to find turtles is September. 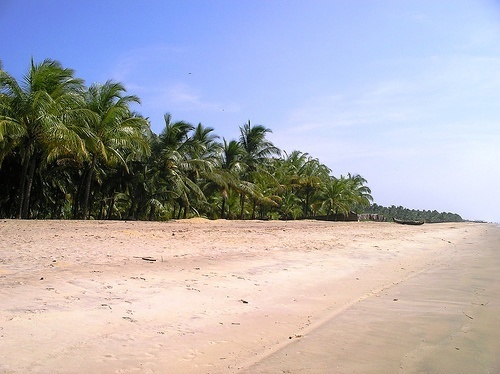 The great stretch of coconut groves along the beach enhances the charm of the beach. This place is close to Vadakara on NH17 towards Mangalore. It is connected by frequent buses with Kozhikode.